Visitors to the Topical High Elevation House often react with confusion when they see the heart shaped leaves of Pleurothallis (Acronia) titan in the Fuqua Orchid Center. Aroid? Begonia? 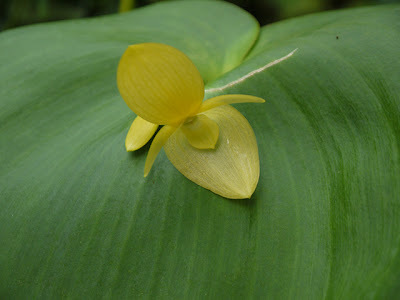 Few people guess that this plant with Philodendron-like leaves and clamshell flowers is an orchid. you can find the characteristic orchid column inside the flower, just visible in the very center of the flower pictured above. And if you're looking for the missing lateral sepals, they are fused to form a large synsepal (the bottom half of the clamshell) located just behind the much smaller lip. Another remarkable thing about this species is its size. In a genus whose name is practically a byword for tiny, Pleurothallis titan is one of the goliaths. The leaves are almost 12" in length. A mature plant can reach 3' in height. Pleurothallis titan grows in Panama and Colombia at 1000 to 1300 meters. Our plants are grown under cool conditions (52 degree nights and 75 degree days) in the Tropical High Elevation House, but I suspect that they would do just as well given intermediate temperatures (58 degree nights). Like most other Pleurothallids it likes 80% shade, even moisture and an epiphytic potting mix (ours is a mixture of premium long fibered sphagnum moss and coarse tree fern fiber). In our Tropical High Elevation House Pleurothallis titan grows happily mounted on trees and in the ground. We can get away with growing some primarily epiphytic orchids in the ground because the soil in the HEH is a very well drained mixture of fir bark, charcoal and permatill). In a small-to-medium sized tropical border Pleurothallis titan makes a great architectural plant. I've placed ours mid to back border where they can be seen rising above shorter terrestrial or semi terrestrial orchids like Stenorrhynchos speciosus, Dichaea glauca, and Isochilus linearis. It really stands out among a grouping of bromeliads. There have been two recent taxonomic revisions of the large conglomerate subtribe Pleurothallidinae-- one in 1999 by the noted Pleurothallid authority, Carlyle Luer, applying a traditional morphological approach; the other in 2001 by Alec Pridgeon, Chase and Solano using a DNA-based approach. The discrepancies between these two approaches have created some controversy. 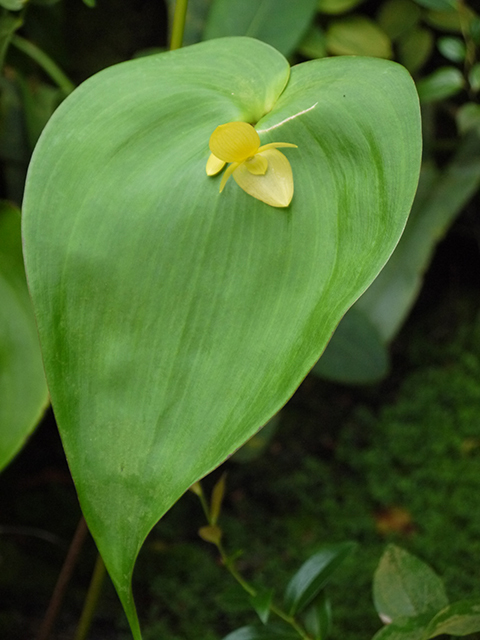 The Luer revision puts Pleurothallis titan in the new genus Acronia. Both appoaches have their merits. More work remains to be done on this group. For a good synopsis see Lou Jost's article on his fantastic website.